Nearly 70 percent of all graduating college seniors in 2012 had a student loan debt and their average debt was $29,400, according to a new report from The Project on Student Debt at the Institute for College Access and Success. (TICAS). College graduates student loan debt increased from 2011 to 2012 by 10.5 percent, an increase from $26,600 in 2011 to $29,400 in 2012. Despite the sharp decline in private education lending, one-fifth of student graduate debt was in private loans, which yield more risks, fewer protections and repayment options and are often more costly compared to safer federal loans. The average student debt from federal and private loans combined increased on average 6 percent per year from 2008 to 2012. A report released in December, Student Debt and the Class of 2012 reports a detailed analysis of significant differences in student debt across states and colleges around the country. For example, students attending colleges in Delaware have twice as much debt compared to New Mexico, and in five states student debts reached an average of over $30,000. As unemployment continues to be high, young college graduates are often the first to be affected. In 2012, 7.7 percent of 2012 college graduates were unemployed, and over 18 percent of graduates were either working part-time positions, unemployed or decided to stop their job hunt. Despite these grim statistics, having a college degree still awards more workforce opportunities as 17.9 percent of high school graduates with no college were unemployed in 2012. State highs and lows: On average student graduation debt ranged from $18,000 to $33,650 across all states in America. 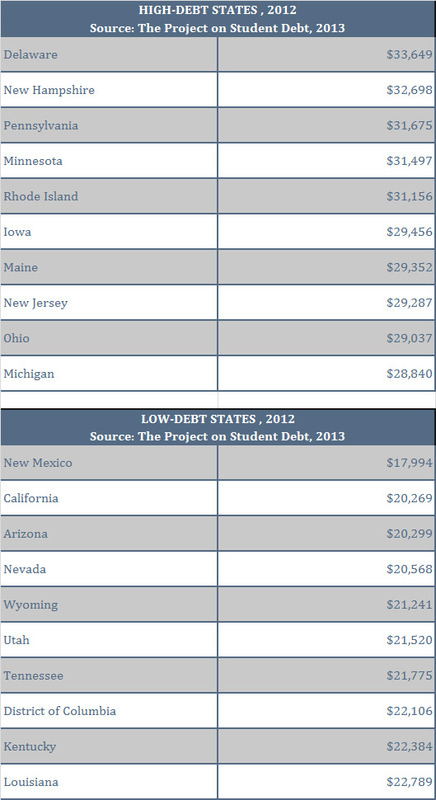 Northeast and Midwest states remained the high-debt states, with Delaware (average $33,649) ranking the highest. Minnesota, New Hampshire, Pennsylvania and Rhode Island all have student loan averages of over $30,000. States in the West and South had the lowest debts, including New Mexico (the lowest), Arizona, California, Nevada and Wyoming. College highs and lows: Average student debt across campuses fluctuated greatly, ranging from $4,450 to $49,450; and between 6 to 100 percent of the share of all students across campuses graduated with loans. On average, students attending colleges with higher tuition typically had higher student loan debt; however, there were instances where high-cost colleges had comparatively low student loan debt. High-debt Colleges: the list below illustrates the colleges that reported the highest average debt for students graduating in 2012. The list is broken into two groups – public and private colleges as tuition and fees are significantly lower at public colleges and universities. The 20 highest-debt public colleges have an average student debt ranging between $33,650 to $41,650, with in-state tuition and fees ranging from $5,800 to $16,150 per year. The 20 highest-debt private colleges have an average student debt ranging between $41,500 to $49,450, with tuition and fees ranging from $12,350 to $40,450 per year. Low-debt Colleges: colleges listed below have the lowest reported average student debt in 2012 ranging from $4,450 to $11,750, eight of the colleges are public and 12 are private non-profit. At the low-debt public colleges tuition and fees ranged from $5,550 to $7,900, and the low-debt private non-profit colleges have tuition and fees ranging from $900 to $37,850.